‘Florence’ was used daily in Berne from 1966 ~1977 before being sold to a private Swiss buyer ~ moved to Hungary in 1992 used as a camper & a ‘rock band’ van. It is in Budapest where our story begins. The poor condition of ‘Florence’ was expected ~ a full restoration programme was undertaken. We were very conscious of keeping her as original as possible, great care & attention was taken when restoring original parts. The design for ‘Florence’ is simple but elegant ~ a cream base with a candy striped bottom which echos her iconic lines. We managed to find two original VW colours, but the pink was special. The vintage hand painted sign cleverly evokes a nostalgic feel. Our vintage ice cream van is very mobile ~ She visits fantastic people at fabulous shows, fairs, fetes, birthday parties, corporate events, festivals & is very popular at weddings. 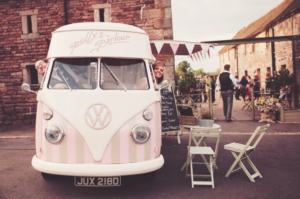 ‘Florence’ is a vintage ice cream van that makes people happy & smile wherever she goes, it’s not hard to see why. She makes me smile all the time, I especially love it when people frantically wave at me whilst I’m driving. ‘Florence’ immediately & subtly spellbinds you, her light brown & pink candy stripes with her hand painted signs are a feast for the eyes. When you hire ‘Florence’ you are not just hiring an incredible hand scooped luxury vintage ice cream van, you also get a piece of classic iconic history ~ something that you will not see again ~ a moment in time for you to savour forever. 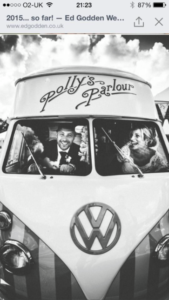 I have fond memories of vintage ice cream vans, the excitement of running to get an ice cream just before they pull off ~ but now there is no need to run….Polly’s Parlour will be ready & waiting ~ you can have as many ice creams as you like ~ all your wishes have come true! 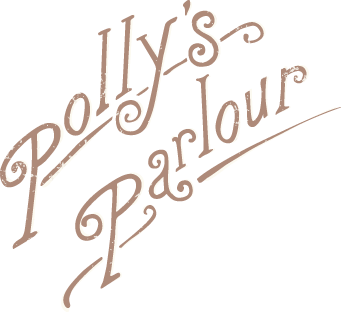 Polly’s Parlour can give you that sense of nostalgia with a twist………but only if you hire ‘Florence’. ‘Florence’ is a unique iconic VW split screen high top & is extremely photogenic. You could use her as a prop for a vintage wedding shoot, old fashioned sea side shoot, retro magazine cover ~ or anything else you can think of. Our special VW ‘Florence’ could be commissioned to use in film, documentary or adverts. I am really approachable & even if you think your ideas are unusual, please feel free to contact Polly’s Parlour.